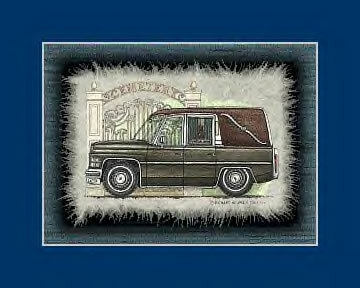 This is reproduction of a watercolor of a hearse outside cemetery gates. To create the original, the artist grinds his own ink, then brushes on Chinese rice paper. All his prints are individually reproduced on handmade mullberry paper using water based inks. The detail is amazing. You can even see the casket spray inside the side window of the hearse bursting with color! Wonderfully unique. Perfect for any funeral director, hearse enthusiast, goth, mortician, embalmer or funeral collector. Print comes on blue mat and hand signed by the artist! Measures 8"x10".